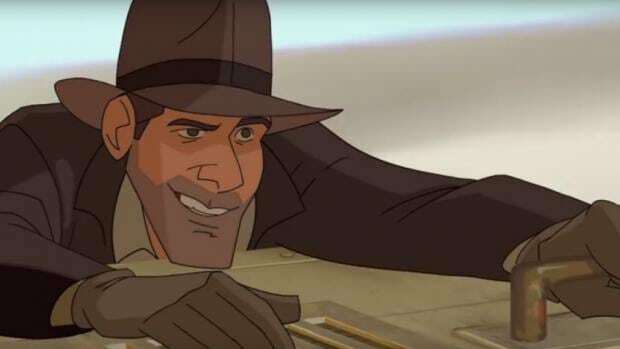 Hopefully, you are like me at this point and thinking to yourself: “Yes, please!” This is an animation by Indiana Jones fan Patrick Schoenmaker and showcases the potential that an Indiana Jones animated series could actually hold. It took him 5 years to make and he has got the likeness and tone of the potential series perfectly. The likeness of Harrison Ford is very good and the different settings and perils the character faces in just a minute and half clip perfectly demonstrates how good this show could be. It would also solve a problem for the Indiana Jones franchise. Steven Spielberg has already stated that his next movie, after Ready Player One, will be Indiana Jones 5 and that it will not be a reboot and will star original actor Harrison Ford. As much of a fan as I am of Indiana Jones, I can’t help but feel this is a bad idea. For starters, Harrison Ford isn’t getting any younger. At the time of writing this he is 74 years old. Not that his age has stopped him and he still managed to make a convincing Han Solo in last year’s Star Wars: The Force Awakens but he was hardly jumping from moving vehicles and swinging across large ravines using a whip. I don’t know how convincing and watchable an aged Indiana Jones will be anymore. It also stops any need to reboot the character. Reboots have had mixed success but nobody really wants to see a brand new actor wearing the iconic fedora that Ford made famous. I’m sure Chris Pratt would do a more than passable job but he wouldn’t really be Indiana Jones. An animated series solves those issues. For starters, the character won’t age and the series can be set at any time. The fan-film has him fighting Nazis but also climbing snow-peaked mountains. Imagination, like the possibilities, are endless. It also means he will always be Harrison Ford. The likeness doesn’t have to change and if he wanted to, you could even get the Hollywood legend to voice the character, I’m sure it would be an easy week for him in a sound booth. If not, there are plenty of passable voice actors who could do the job without having to change the character completely. What is even better is that the studio that owns Lucasfilm and subsequently Indiana Jones is Disney. It is a match made in heaven. Disney have pioneered animation and delivered some fantastic series, why couldn’t this be another one? Overall, Patrick Schoenmaker’s fan-film has lit a desire in me for an Indiana Jones animated series and demonstrates that it could be done. It brings the character back to life without compromising his memory or feeling the need to recast the part. Also, think about the different, exciting and endless possibilities an animated series gives such a cool character as Indiana Jones. Make it happen Disney. Come on Disney, make it happen!